The deck was compiled from public domain and creative-commons diagrams available to the public. 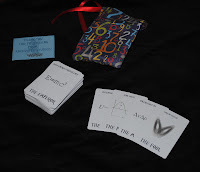 The Mathematics Tarot interprets the tarot archetypes through the lens of mathematics and physics. It came with three extra cards (The Mathematician, Möbius and The Empty Set).